Cyrious SMS allows the User to define monthly sales goals. The sales goal numbers are used on the Sales Graph and the Activity Report as an indicator of what level of sales you want to achieve for a given month. 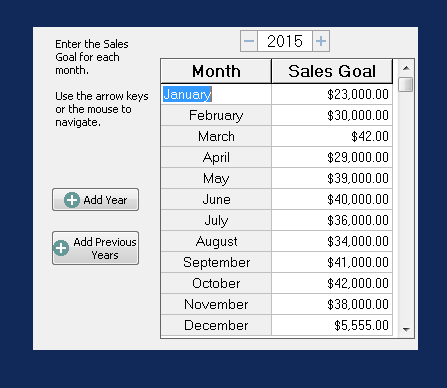 From here you can customize your Sales Goals for each month. Beginning with SMS version 8.91 you now have the ability to track Sales Goals across multiple years. Just click Add Year to go forward and click Add Previous Years to track Historical records. These Goals are reflected on your Sales Graph and your Activity Report.